Shigeo Fukuda is truly creative illustrator. His use of negative space and symbols is amazing. Each piece looks refreshingly new and has a great smack of graphic design. Every one creates a page pausing moment. Some of his works are remotely similar to those of M.C.Escher, yet totally different. This collection of Shigeo Fukuda's brilliant and witty posters is aptly titled Masterworks. The artist has personally chosen each poster and then arranged them in the order presented here. These are the pieces he feels will communicate visually across all cultures around the world. 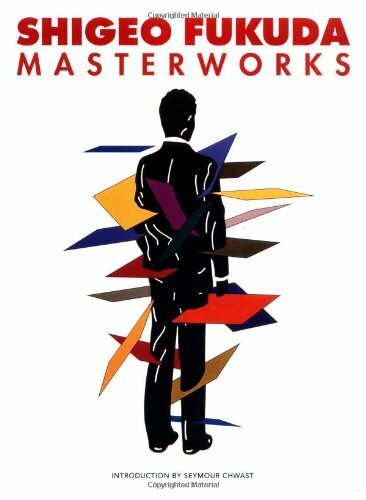 As Alan Fletcher has pointed out, Shigeo Fukuda, like all great creative minds, understands that to manipulate our perceptions is to see the world in a new way. Through the posters we come to appreciate how little we really notice about the world around us. By making us stop and look, Fukuda makes us more aware and more appreciative of not only what we see but also how we perceive reality itself. In addition to the posters in this book, and hundreds more, the artist has produced important work in a wide range of media including illustration, three-dimensional sculpture and monuments as well as industrial design and commercial advertising. Born in Tokyo in 1932, Shigeo Fukuda graduated from the Tokyo National University of Fine Arts and Music in 1956, Since then, his unique style and provocative images have earned him a reputation as one of the finest and most creative poster artists in the world. Here are some pages. Enjoy.